Word game aficionados, meet your latest challenge. 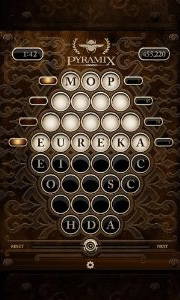 Pyramix, a "word enigma generator" for your Android device, is an addictive game that combines code-deciphering strategy with the simplicity of classic grid-based word games. Drawing from a jumbled assortment of letters, try to find the right letter combinations to solve unique four-word puzzles. Play against a timer or work in untimed mode, and take in the mysterious-looking graphics and evocative sound effects. The pyramid-shaped game board consists of four empty, horizontally-stacked rows. At the bottom of the board, you'll see a mirror image of the top rows--but these rows contain jumbled letters. To build a word at the top, take any letter from the bottom and drop it in the space you choose. Counters show the number of possible words for each row. Lights glow when a row is filled with a complete word. But remember, the more rows you fill, the harder the challenge gets! Be strategic and keep an eye on the counters as you create words. Good luck! I have Pyramix on my Nook and is my favorite game but my Nook’s battery is not working as it did when I bought it. I also had it on my iPad but when I upgraded to my iPad Air 2, I no longer get the game. Apple says because it has not been upgraded it will not work with the IOS upgrades.